If harvest season were a novel, this would be the denouement. For the past few months we’ve had farm-fresh produce delivered right to our door through a CSA with our neighbour’s family farm, and it’s been a fantastic experience. Unpacking the box every Saturday afternoon felt a bit like Christmas: what do we get this week? Raspberries! Baby kale! Golden beets! I’m sure it was just a few weeks ago that the volume and variety of veg in the box reached a fever pitch, but now it’s tapering off, and this week we’ll see our last box. One thing I have especially enjoyed about the CSA is how seamlessly the season unfolded. First, shoots and greens, then ripe juicy veg, then the hardened and sturdier roots and gourds. Of course, the progression isn’t neat and tidy; along with the last of something you get the first of something else. Like the last of the tomatoes, and the first autumm squash. This first squash was funny, though – pale, tender flesh like zucchini, skin as tough as an autumn squash. Not quite summer squash, not quite autumn squash. What to do? Turn on the oven, I thought. A long slow bake does wonders for both squash and tomatoes, after all. Toss in some leeks, fresh herbs and a generous sprinkle of parmesan cheese, and you’ve got yourself a delightful side dish. Or, with a fried egg and some crusty bread, a divine brunch. Few better ways to say goodbye to summer’s last veg. Cook the leeks: In a medium-sized skillet over medium heat, saute the leeks until soft and lightly browned, about 15 minutes. Spread the leeks evenly in the botton of an oiled square baking dish, and let them cool. To assemble the gratin, start with sprinkling some of the chopped herbs over the cooked leeks. Starting at one of the baking dish, lay down a row of slightly overlapping tomato slices,propped up slightly at an angle, and sprinkle them with herbs, salt and pepper. Cover the tomatoes with parmesan. Next, arrange a layer of squash slices over the tomatoes and repeat with the seasonings. 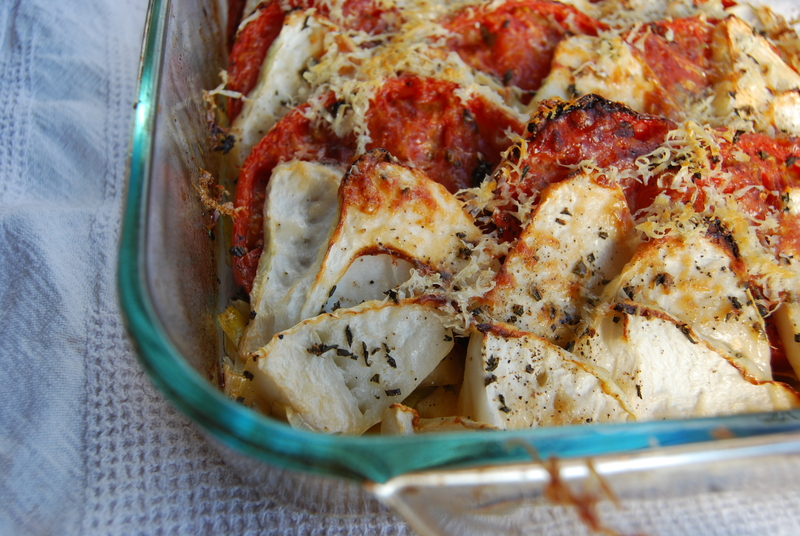 Repeat with alternating layers of tomatoes and squash, seasoning and covering with cheese, until the pan is full. Sprinkle the whole thing with a healthy pinch of salt and pepper, the remaining herbs and cheese, and drizzle the whole thing with olive oil. Bake for at least an hour, during which time the juices will bubble and reduce significantly, and the top will be well browned. Can be made in advance and reheated before serving. This gives the flavours even more chance to get acquainted.